FULL ACCOYO; perfect conformation; great lock structure; lustrous fiber; full body capacity; proven mother, unassisted births. Kiki is shown with her first cria, Kiki's Accoyo Pilar who won, at the 2001 AOBA Conference in Portland, Oregon, the FRED WALKER TROPHY awarded annually to a first time exhibitor in fleece quality. Pilar is the FIRST suri ever to win this award!Kiki's 2005 full Accoyo son has tight pencil locks and a micron count of 16.8! Kiki has given us beautiful full Accoyo offspring. Kiki's 2007 cria is ACP FAWN ACCOYO KATIA. Kiki puts her "fawn stamp" on most of her crias. Kiki just gave birth to a super dense highly lusterous male. 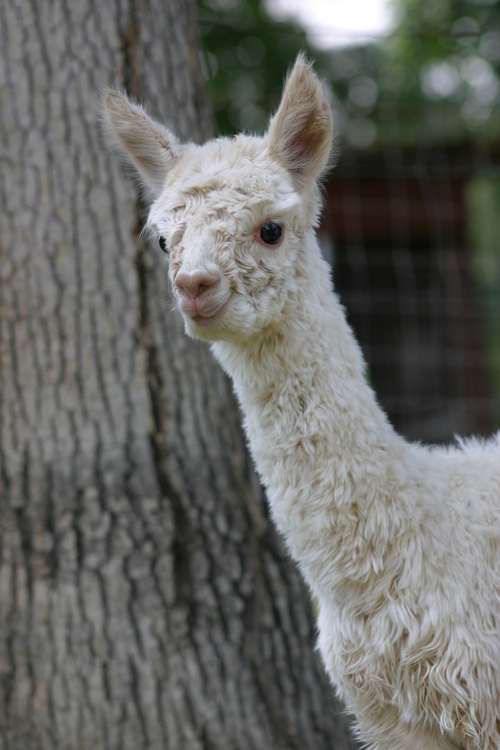 This boy has all of the fleece characteristics you could want. He is amazing. He takes after his daddy. At 1 month of age, he is already trying to breed the other moms.